Looking for holidays to Spain with plenty of VIP style (and at a price tag that suits you)? Whether you are looking for weekend city breaks or week long holidays with beautiful beaches, here’s why we think Spain makes a great destination for any kind of trip. Discover how a stay on a boat in Spain will add that extra touch of VIP treatment your next dose of Spanish charm. Holidays to mainland Spain for the majority revolve around the Costas. Up north in Catalonia, you’ll find the rugged Costa Brava and Costa Dorada. On the East coast you will find the Costa Blanca’s white-sand beaches. Make for the South and you’ll discover the sun-soaked, more lively ‘Costas’ (including the Costa del Sol and Costa de la Luz). Choose from the larger beach resorts to sleepy, whitewashed villages and cutting-edge restaurants or backstreet tapas bars. When it comes to mixing old and new this region has all the mod cons, but without losing the Spanish charm that made it so popular in the first place. This is predominantly the reason that most travellers are looking for Southern Spain holidays and it is here that you will find a large variety of boats to sleep on. Apart from its sun kissed beaches, Spain’s Cities are also wealth of historical and cultural landmarks. It produces some of the finest food and wine in the world too. The country boasts mouth-watering dishes that will reinvent your idea of what good food is. Indeed it is often a tradition you’ll get served free tapas with your drinks. So where does one go to get the most out of this culture and gastronomy? The Costas are also your gateway to some of Spain’s must-see stylish city breaks in Spain, including Barcelona, Granada and Seville. Floating in the Mediterranean, just off the east coast of the mainland are the Balearic Islands. Each has a personality of their own and are perfect for short breaks to Spain. Choose from family-friendly Majorca, low-key Menorca, off-the-radar Formentera, and hip and happening Ibiza. Needless to say, they all come with beautiful beaches, countryside scenery and a relaxed way of life that’s typical of this part of the world. Spain has consistently high temperatures. Being located just a short hop from home soil means it has become an all year round favourite for sun seekers. On the mainland during July and August you can regularly expect to experience 30°C. In the Balearics you can enjoy around 11 hours of sunshine a day. In the Canary Islands, the thermometer rests comfortably in the top 20s. Spring and autumn are warm, too, with temperatures in the mid-20s. If it’s late deals for winter sun you’re after, our recommendation would be to head for the Canaries or The Costa del Sol. Temperatures here frequently range between the late teens and early 20s. (Bear in mind that you might see a bit of rain, though). It’s this combination of weather and the Spanish way of life – live slowly, enjoy yourself, eat well, and relax – which gives the country so much character and all the more reason to stay on a boat. To find and book your next holiday to Spain, simply visit the Beds on Board website, sign up and start using the search panel. 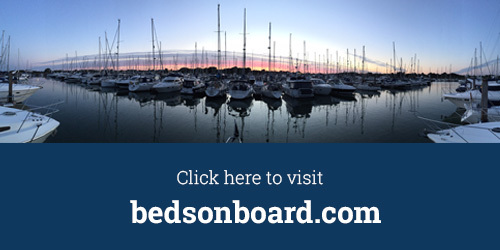 Don’t worry if you have some questions, you can contact us at questions@bedsonboard.com or visit our Frequently Asked Questions blog. Where we go to stay on a boat in Spain: Our favourite destinations are Palma, Mallorca and Barcelona.